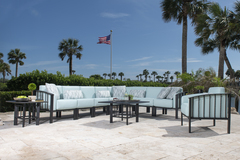 Quality Outdoor Sectionals like Sag Harbor, Ipanema, Montecito, Westport, Bay Shore sectionals by brands like Kingsley-Bate and Woodard – you can’t go wrong. 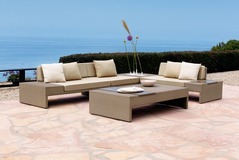 Traditional outdoor seating. 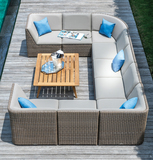 Wicker Sectionals. 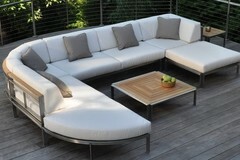 Modern Design & Sensibility. Years of All-Weather-Use. 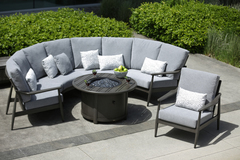 Outdoor sectionals are exactly what your patio, deck, outdoor bar or garden need when seeking hours of outdoor enjoyment with friends or family. 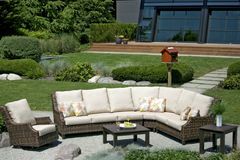 Take a look below for a stunning overview of our outdoor sectional collections and click on any to view a more detailed breakdown of the furniture components. With manufacturers like Kingsley Bate, Woodard, Brown Jordan and Ratana you can’t go wrong. 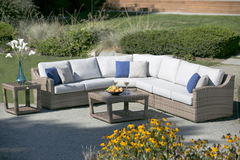 Choose your finish and fabric to create the ambience you desire. If you need help from a design expert just call us at: 1-844-451-5125.